Cook your rice mixture according to the package instructions and add the diced mushroom stems, before you start the pheasant, and keep warm. Flatten the skinned pheasant breasts between two pieces of plastic wrap to about a quarter inch each and spread a small amount of Dijon mustard on each breast piece. Lightly salt and pepper. Heat a nonstick fry pan to medium high and add half the butter and brown the breasts on each side till just done. This means as soon as the juices run clear, remove the pheasant breasts from the pan and keep warm. This will keep the breasts from drying. Add the pine nuts to the same pan and brown with the pheasant juices. Remove and set aside. In this same pan add reserved butter, garlic, and mushrooms. Cook for five minutes and then add the wine. Bring to a fast simmer and remove from heat. Blend the diced mushrooms in with the hot cooked rice mixture. 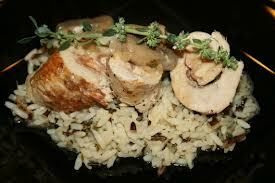 Place a portion of the cooked rice in the middle of an individual dinner plate, top with a piece of browned pheasant, now the cooked mushrooms and sprinkle with the warm cooked pined nuts. Serve with a tossed green salad and vegetable of choice.